Halifax (2001 pop. : 276,221) - Halifax Regional Municipality encompasses the former cities of Halifax and Dartmouth, the Town of Bedford and the County of Halifax -- an area larger than Prince Edward Island, and home to forty percent of our province's population. The Halifax Regional Municipality is one of the newest municipalities in the province, in terms of date of incorporation, therefore most of its history relates to the issues relating to municipal amalgamation. 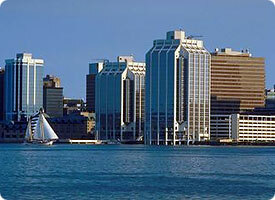 Since amalgamation into HRM, the term "Halifax' refers to the Metropolitan Area, which follows the boundaries of the former city (Halifax Peninsula and Mainland Halifax), although the communities that comprise Mainland Halifax that were amalgamated into the City of Halifax in 1969 are reasserting their identities. The urban core area of HRM is located in the western end of the municipality, fronting on Halifax Harbour in the Halifax - Dartmouth and Bedford area and constitutes the most populous urban area on Canada's Atlantic coast, and the second largest coastal population centre in the country, after Vancouver, British Columbia. HRM's climate is heavily influenced by its location on Nova Scotia's Atlantic coast. The weather is usually milder or cooler than that of central Canada, with the temperature remaining (with occasional notable exceptions) between about -5°C (23°F) and 28°C (80°F) inland but the coast can be milder in the winter and cooler in the summer with the maritime influence. The Halifax Regional Municipality is a major economic centre in eastern Canada with a large concentration of government services and private sector companies. Major employers and economic generators include the Department of National Defence, as well as the Port of Halifax. The municipality has a growing concentration of manufacturing industries and is becoming a major multi-modal transportation hub through growth at the port, the Halifax International Airport, and improving rail and highway connections. The Halifax Regional Municipality's urban core is the largest population centre in Atlantic Canada and is the major cultural centre within the region. The municipality's urban core also benefits from a large population of post-secondary students who strongly influence the local cultural scene. HRM has a number of art galleries, theatres and museums, as well as most of the region's national-quality sports and entertainment facilities. The region is noted for the strength of its music scene. HRM has also become a significant film-production centre, with many American and Canadian filmmakers using the city's streetscapes, often to stand in for other cities that are more expensive to work in. Halifax is a sister city of Halifax, England, Hakodate, Japan (1982), and Norfolk, Virginia (April 27, 2006).